Donations go in full to the author. Once the target amount is reached, production will begin. Select the amount, click on it, fill in your email and credit card info. Following your submission you'll receive a confirmation email. Nairobi, Kenya has been blessed with natural resources that have been at the core of her economic success. From her city wilderness hosting an array of different animals to a natural park accessible throughout her central business district, her blessings are immeasurable. But all is not roses in this equatorial city; her main river is dying. This is a result of poor urban planning to host her ever-growing rural – urban migration that has seen the rise of forty-six different informal settlements all located on its riverbed. This is further coupled with pollution from both man and factory. These activities have been on-going despite various interventions by both government and Non-governmental organizations. But now two decades on the roles have been reversed. 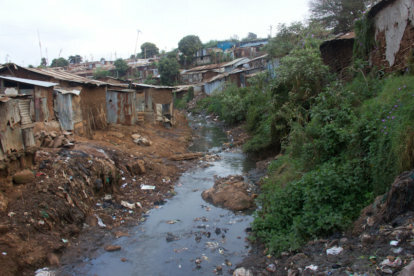 Communicable diseases such as typhoid and cholera have caused the residents along this riverbed to fight back pollution in a bid to see a decrease in the rate of these diseases that have claimed the lives of countless children and men. Kibera the most populous slum in Africa and one of the biggest in the world is the most affected by environmental pollution. This is due to its proximity to the Nairobi Riverbed. Her residents have been taking various steps to clean this river that was once the pride of Nairobi; not only for themselves but the various generations to come thereafter. The rise of an environmental conscience population has awakened a new desire of having a better tomorrow. This specific task of cleaning the river has birthed other positive environmental changes. These changes include recycling options that have become favoured by many. One famous recycling method currently being a custom to her residents is Biogas. This method has simplified the cooking time for many households and as a result helped protect the environment by decreasing the dependency of charcoal a by product of trees. Thus proving that we can go green as a people. The video will show, how in recent years the challenges facing the Nairobi River have been prioritized by the Nairobi County Council who has taken an educational capacity to ensure that persons residing along its path become part of the solution and not the problems facing the river. Thanks to your great support this story is completely funded and can be watched here!